Posted on October 8, 2008 by ♥ N o v aTagged dogs. wow! a wolf pet! amazing! what breed is she? she\’s gorgeous. is she named Wolf? i guess we all need a little love. and you know what, we also need to give love too. wolf is wise, and so are you for recognizing your needs. awww… this was the sweetest post!i\’ve been going through some of the same emotions as you during these past few weeks… i\’m really depressed. Oh that´s so sweet. But how do you make time?? You work full time? You have a small child? And your wolf??? I would probably kill my self if that was the case ;O) I´m impressed. dogs always know when we are struggling. jack does the same thing… When he\’s most obnoxious is usually when I\’m at my low points. Lucky for us that we have such attentive, loving dogs. Beautiful dog, by the way. Happy Friday! they truly are a man\’s best friend huh? i hope the both of you feels better! Nice dog. I\’ve always been drawn to the wild charisma of breeds of dogs mixed with or descendants of wolves. After reading the first paragraph, I gotta say that I knew all that she needed was some attention and love. But as I read on, I\’m glad you became in tuned to her needs. Wolf, the dearest wolf. I am glad you took a moment. Sometimes it is a moment that all is needed. That\’s a beautiful wolf you\’ve got there! I sometimes want a big pet to hug and wrestle with. :-)Thanks for leaving a comment on my blog! I\’m happy you have the intention of sending me some Herbal Essences, he he! Sweet story, Nova.And you have 20 comments! Sure you weren\’t popular in high school? you just inspired me to give Pono a hug. OMG you are so cool! wolf for a pet? wow. what kind of dog is that nova? B: Awww, I\’m glad you did hug Pono. Pets are the most loyal love we will ever get in our life.Ceemee: That\’s exactly why I wanted a big pet: bigger hugs!Ciara: Thanks!Deleine: I really don\’t have any time. I\’m tired all the time. I have to juggle and prioritize all the time. It\’s not easy.El: I still went out, hahaha. I just end up taking her wherever I go.Gary: Wow, your son is awfully philosophical, and smart. Gee, I wonder where he gets that from! ;)Graham: Trust me, I was not popular in high school at all!Hagelrat: Thanks!J-Bear: She\’s my little girl!Joey: She\’s a wolf/malamute mix. Her name is Akira. Lance: She is amazing indeed.Leandra: You\’re absolutely right.Leyton: There is nothing in this world like a wolf\’s touch.LH: I\’m sorry that you\’re feeling depressed. I wish I could come over and we could sit and have tea and lament over our troubles.Marcy: Their animal instincts are so sharp. It\’s like they can just sense when we humans hurt inside.Nora: We are lucky indeed. I\’d like to see a picture of Jack!Papa: You\’re right. She absolutely knew I could use the love and attention.Prinsesa: No, I\’m not cool. She is! 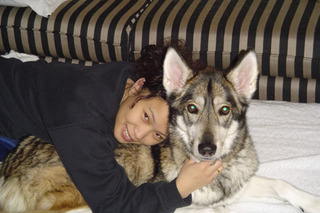 She\’s 75% wolf and 25% malamute.Sab: Thanks, we are both doing much better! =)Seraphine: I\’m not nearly as smart as my wolf. It took me quite a while to figure out why she kept whining to me.Sky: You\’d be surprised at how many people don\’t understand just how important our pets are to us. Some look at me like I\’m crazy whenever I talk about my dog as if she\’s my daughter. I\’m sorry to hear about your babies. =( Their love is irreplaceable.Wanderer: If you ever come visit me, I\’ll let you pet her. =)Will: Well, you live with a lot of American Indians, right? I heard that the Indians revere the Wolf.Zee: A moment is all that was needed. Amazing how just moment come few and far between. you don\’t need to be smarter than a wolf. sometimes it\’s enough just to listen. hugs.